Looks like I’ll be busy for the next six months or so. This list is just about all of my favorite authors. 2012 is gonna be AWESOME! By the way, have you started your 2012 Reading Challenge yet on Goodreads? I’ve already read 8 books out of the 35 that I predicted as my goal for the year. I have a feeling I’m going to go over since this is only February. I’m thinking about doing a contest for my readers to guess how many I’ll go over by and then whoever comes the closest at the end of the year will win some sort of a prize… what do you think? I credit author Jenn Thorson for the contest suggestion during a recent discussion on Twitter. Thanks Jenn! I was pretty quick with this one – it JUST got released on September 21st. As much as I wanted to start reading it the day it was delivered to my Kindle (since I pre-ordered it), I had to finish the other book I was reading first so I didn’t start this one till Saturday night. I don’t have the attention span or good enough memory to read two books at once. I’m not going to rehash the entire five-book series before “Mini Shopaholic” because if you’re reading this, you’ve most likely read at least one of the books already. The last time we saw Becky Brandon (née Bloomwood), she was expecting a baby. Fast forward several years, Becky and Luke have a darling 2-year old girl named Minnie. Unfortunately, Minnie has gotten her mother’s genes when it comes to loving material things and being stubborn. Luke begins to worry when Minnie gets kicked out of her FOURTH Santa’s Grotto (apparently that’s what they call the Santa visiting displays in England) that perhaps she is out of control and has a behavior problem. They look into nanny services that are known to have structure and teach the children multiple languages and martial arts and well, that doesn’t turn out so well. Becky is also determined to do something special for Luke – throw him a surprise party. Luke isn’t fond of birthdays. When Becky brings up this idea for their family and friends, they are skeptical that she would actually follow through and be able to keep it a surprise. As Becky is planning, she goes a little crazy with the ideas and of course, gets in over her head. Then, an unexpected guest comes in to offer their help…. Along the way, Becky is trying REALLY hard to control her spending. At Christmastime, she promises Luke that she will wear each of her items of clothing three times before she is allowed to buy herself something new… which would last her until October of the next year. While she’s trying not to spend for herself, she feels that it’s okay to spend on Minnie and take it out of her “pocket money” account, which she doesn’t really have yet because she’s only 2. Luke’s suspicions about Becky’s spending are heightened even more than usual as she’s trying to hide the birthday party planning and he thinks she’s gotten herself into spending trouble (again). As much as I like reading this series for entertainment value, sometimes I think Becky’s a total idiot and want to shake her shoulders and yell at her, “Haven’t you learned your lesson yet?? ?” The book was a VERY quick and easy read and took me less than two days to read. One really stupid thing bothered me: all of the dates mentioned in the book were between 2005 and 2006. There was one reference to a variety of Google products including Google Chrome, Google Wave, Google Voice, etc. Um, those things weren’t around that long ago. I guess none of the editors caught that one. If you’ve read the rest of the series, you must read this one. I also suspect that there will be another addition to the series after this one based upon how the book ended, but I won’t give you any more hints than that! Those are all of the ones that were high on my radar; I hope I’m not missing any! Looks like I’ll have a busy summer ahead of me. Keep an eye out for these at your favorite bookstore and you can be sure I’ll be blogging about them as soon as I finish! 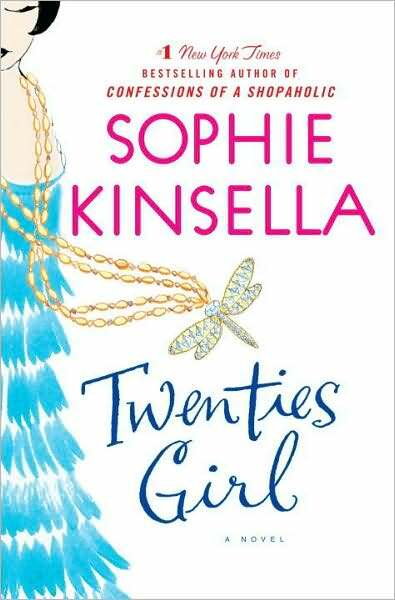 “Twenties Girl” is the newest novel from Sophia Kinsella, author of the wildly popular “Shopaholic” series. It came out last summer and of course, I had to get it right away. I think I actually may have downloaded it on my Kindle the day it came out. I’ve read all of her other books, including the ones published under her REAL name, Madeleine Wickham. This is a cute story about a young British woman named Lara who unwillingly befriends the ghost of her recently-passed great aunt. The ghost doesn’t come back as an old woman, instead she comes back as a wild partying flapper from back in her younger days in the 1920′s (hence the book title, “Twenties Girl”). Of course, Lara is the only one who sees and hears Sadie (that’s the great aunt/ghost) so there are quite a few situations where Lara looks like a crazy person when she talks to Sadie in public. At first, Lara resists Sadie, but then she understands that Sadie won’t leave her alone until she finds the pearl and dragonfly (I love dragonflies, by the way) necklace that Sadie lost before she passed. This sends Lara on a crazy quest to track down the necklace in order to get Sadie to leave her alone… until she realizes that she has actually become friends with Sadie the ghost and doesn’t want her to leave. She’s learned to rely on her for advice and companionship. I liked this book because although it was a chick lit book and there was a romance involved, it had a different spin to it and I’ve never read another chick lit book about a ghost (at least that I can remember). P.S. “Twenties Girl” made it onto the Chick Lit 100! And pretty close to the top of the list, I might add.